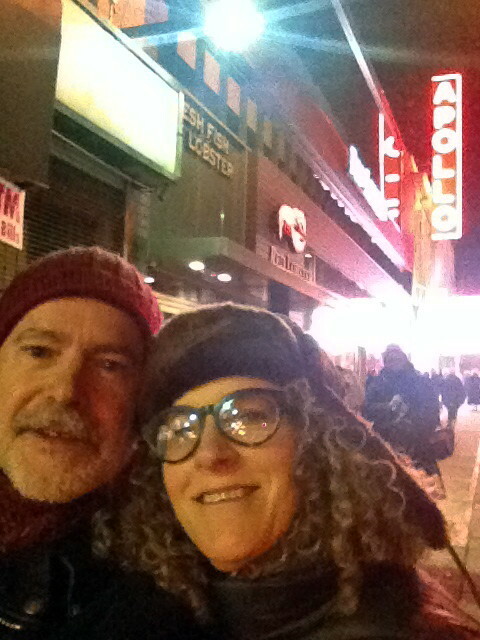 12.16.13 – The invitation-only tribute to Lou Reed at the Apollo Theater was a beautiful event – a classy, intimate, surprising blend of musical performances, spoken testimonials, film and audio clips, and multi-faith spiritual expression. Welcoming music came in the form of a guitar jam between Marc Ribot and Doug Wieselman. 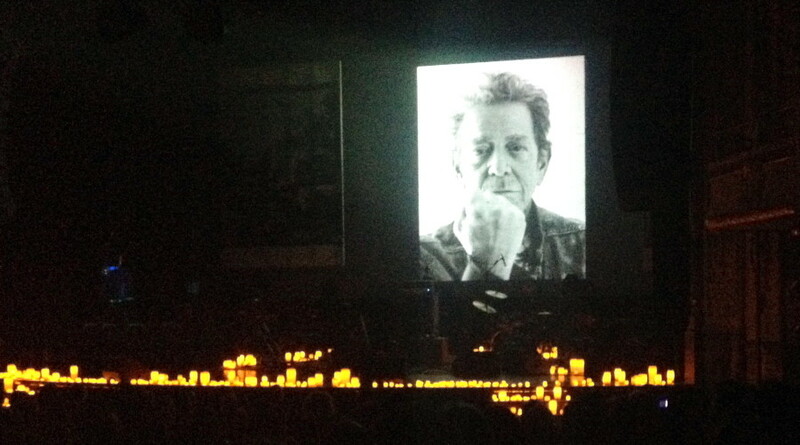 The program officially began with Rabbi Levi Weiman-Kelman performing the funeral prayer “El Maleh Rachamim.” Laurie Anderson opened and closed the three-hour ceremony with very personal recollections of her life with Lou. She talked movingly about his final days, his last words, his last breath, his last gesture. They had immersed themselves in Buddhist meditation, so she and her community observed the 49-day period of practices after someone dies, according to the Tibetan Book of the Dead. The memorial at the Apollo took place on Day 50, which is dedicated to the liberation of the soul of the departed. And she said they’re very clear and strict about “no tears,” weeping seen to be confusing to the soul passing through the bardo. Accordingly, this was an evening of much celebration and laughter, emotion and sentiment but no tears. There were lively reminiscences by Lou’s sister Meryl (aka Bunny), producer Hal Wilner, Julian Schnabel, Ingrid Sischy, the Velvet Underground’s Maureen Tucker (reading a message from John Cale), and the surgeon who performed Lou’s liver transplant, Charlie Miller, who was hilarious and touching and apparently stitched up his famous patient to the beat of “Walk on the Wild Side.” Early on, Patti Smith sang “Perfect Day” accompanied on guitar by Lenny Kaye, and she took the lead for the all-hands-on-deck finale, “Sister Ray.” Emily Haines of the band Metric sang “All Tomorrow’s Parties,” Debbie Harry did “White Light White Heat,” Jenni Muldaur sang “Jesus,” and the Persuasions (who opened for Lou’s first European tour) came out to croon a gorgeous a cappella rendition of “Turning Time Around.” John Zorn’s sax solo represented Lou at his most abrasive and improvisational. Philip Glass sat down at the piano and played while the rabbi sang and Hal Wilner translated the Kaddish. For me, the musical high point was Antony performing “Candy Says” to Marc Ribot’s simple acoustic guitar accompaniment – fitting for Lou’s song about transgender Warhol diva Candy Darling to be sung by a gender-queer performer who clearly understands its existential self-disgust from the inside (“Candy says I’ve come to hate my body/And all that it requires in this world”). It seemed curious to me that only the Persuasions sang a song written after 1973 — Lou made a lot of albums and wrote some good songs after Berlin, but I suppose it’s a recognition of how solid those early Velvet Underground songs were and still are. I would guess Hal Wilner had a hand in amassing the various amazing film clips that conjured Lou’s presence, starting with an excerpt of “Waiting for the Man” (live in concert during his dyed-blond days) and including several chunks of a very funny interview in which he talked about why he lives in New York, what he hates about Long Island, what scares him about Sweden, designing his own eyeglasses, etc. I’d forgotten that Lou was in Paul Simon’s movie One Trick Pony, but we watched the whole clip, in which Lou plays a record producer imposing egregiously bad arrangements on Simon’s character’s album. Then Simon himself came out to sing “Pale Blue Eyes.” Two radically different audio clips were also highlights of the evening – Lou as a kid singing “Santa Claus Is Coming to Town” and then the unedited original studio demo of Lou strumming guitar and singing “Heroin,” still an astonishing song. Laurie remarked that Lou wrote his lyrics very fast, sometimes in the middle of the night, and never changed them, believing in “First thought, best thought.” Which, she admitted, she found infuriating, as someone who labored and worried over every single line. A rich full occasion. I was delighted to share it with my friend Judy Mam. This entry was posted on	December 19, 2013 at 10:16 pm	and is filed under performance diary.